Who taught you how to cook? What is the most important thing you learned from her? I first learned to cook by sitting on the kitchen counter watching my mother. I’m one of seven kids, so she did a lot of cooking every day. She also hosted a lot of dinner parties. She taught me the value of mise en place. She’d do everything ahead of time, and then be able to join her guests and have a great time. Crêpes, which my mom called “roll-up pancakes.” When I was about 10, she taught me to make them for my little brother and me on Saturdays, so I wouldn’t wake her up. I rolled them with grape jelly and sprinkled them with powdered sugar. Everybody should know how to roast a chicken. I season the chicken well, stick some lemon in the cavity and rub it with olive oil or butter. Then I start with the oven high and finish it low. Who is your food mentor? What is the most important thing you learned from her? My friend Pamela Westbrook, who drew me into professional cooking. She told me that if you learn technique rather than recipes, you can do pretty much everything. 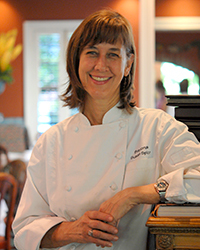 She was the first woman I knew in New Orleans who was working as a professional chef in a restaurant kitchen. Paula Wolfert’s The Cooking of Southwest France. I consider her a mentor, through her writing. Her books are so evocative and personal. I love the way she writes. It’s more aptitude than a skill. You have to have a feel for it—and a fearlessness, which is what Julia Child conveyed so well. What is the best-bang-for-the-buck ingredient, and how would you use it? Vinegars. I like sweet things but I like a little tang, and vinegar is great for that: I like to finish a caramel with vinegar for a dessert. I also like it for finishing a gastrique. We do a duck sauce that’s a vinegar reduction with a little pepper jelly. Yuzu and yuzukoshō, the yuzu paste with the green pepper. I’m a citrus lover. I have a kaffir lime tree in my yard, and I’d love to grow yuzu. Best-bang-for-the-buck food trip: Where would you go, and why? I have to say New Orleans. The food is so reasonably priced compared with most cities. Even our fanciest restaurants are less expensive. And we have so many casual options, from fantastic Middle Eastern or Vietnamese, to Latin groceries, taco trucks and seafood joints, although these are becoming rarer. Our coffee is also strong, delicious and cheap. I bought a hat in Florence that I love. It’s gray flannel, almost like a derby, with a deep orange headband. What do you consider your other talent besides cooking? My husband bought me a pedal steel guitar, and my goal is to learn to play it. I don’t have the talent yet, but I hope to develop it. I’d take Mario across the river, to the West Bank of New Orleans to eat Vietnamese food. Or we’d go to El Crucero, in Corella, Spain. The dining room is over a village bar, and the chef does wonderful, deceptively simple food. It’s wine friendly, rustic and delicious. I would bring lime and chiles and try to find some fish to make ceviche. At least I wouldn’t get scurvy. Maybe algae. I don’t know how far the locavore trend will go, but people are always looking for new superfoods. What are two or three dishes that define who you are? 1. Crawfish curry, because I like using local ingredients in exotic ways. It’s like an étouffée with Indian flavors. We make it with a crawfish stock, and serve it with Louisiana jasmine rice. The curry paste marries well with the crawfish. I also like to make condiments to go with it, like chutneys and raita. 2. Smoked quail salad. We marinate the quail, cold-smoke them and tempura-fry them in a rice-flour batter. We serve them with local greens, ripe pears and a bourbon-molasses vinaigrette, which incorporates a little stock made from the quail wings. We finish the salad with spiced pecans. Ice cream, preferably Häagen-Dazs coffee, my very favorite. Anything salty-crunchy, any kind of chips. I like Ruffles, the classic version. The worst part is I like them with mayonnaise. We lived in Holland when I was a kid, where I got used to french fries with mayonnaise. Now I like that with potato chips. What is the best new store-bought ingredient/product, and why? Schexnayder’s South Louisiana Hurricane Sauce. It’s an excellent remoulade sauce, the balance is just right. I used it on fresh trout last night. When I cut a cucumber, I rub the ends on the main part. It’s supposed to take the bitterness out. It’s an old wives’ tale, but it’s easy to do, so why not? My post-service ritual is a glass of wine. I tend to drink white wine, it being warm down here. I like Spanish white wines or a Pinot Gris.